Published March 18, 2018 at 2502 × 1858 in Kriegsgräberstätte (War Cemetery) Roye-St.Gilles. 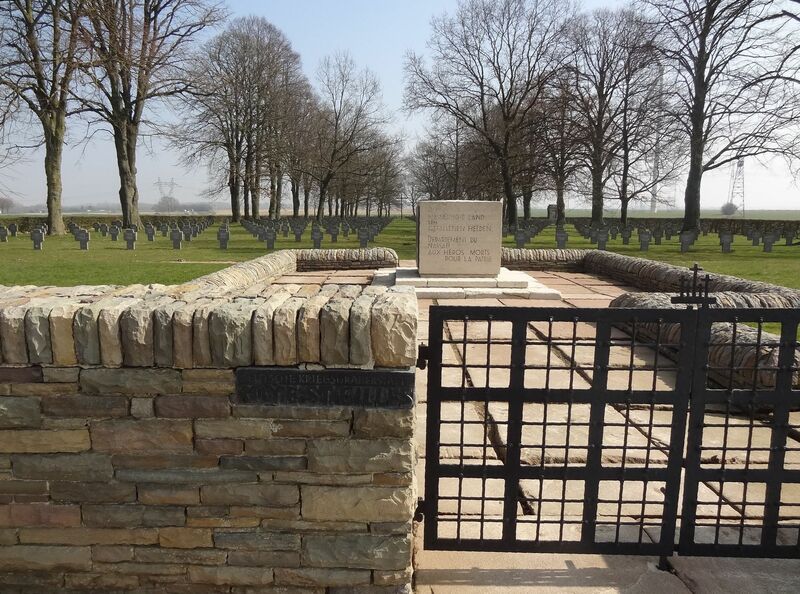 Begun by the advancing Germans in March 1918, this military concentration cemetery was laid out in its current form in 1920 by French military authorities; remains were recovered from battlefield cemeteries and isolated graves in 49 communes. Although a little over 2,000 graves are from the fighting in the autumn of 1914, and from the spring of 1915 to the summer of 1916, the majority are from the battles of the spring and summer of 1918. Work was undertaken in 1927 to improve the cemetery, including the repair of two memorials, but permanent markers were not installed until 1972. Commemorated here are 3,755 soldiers in individual graves (of whom 126 are unknown) and 2,780 soldiers in two communal graves (of whom only 116 are known by name). The 85 British soldiers buried here in March and April 1918, whose graves were marked with numbered pegs, were reinterred in Roye New British Cemetery in 1920.